My love for scones and lemons continues. If you follow my blog at all you will know that I love making scones. I have made a couple of lemons scones, the latest being lemon and blueberry. 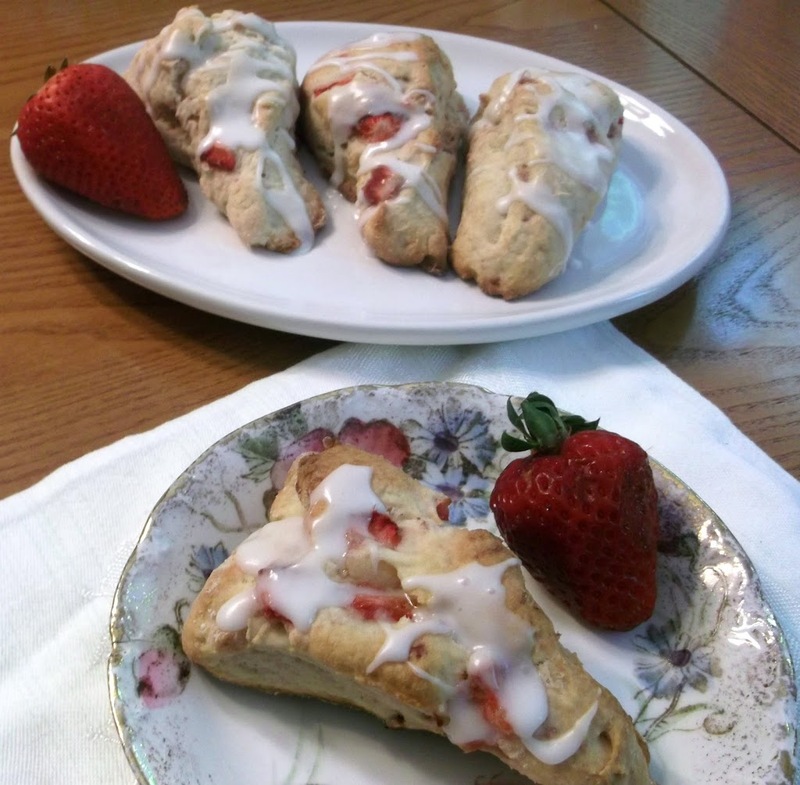 I had some strawberries in the refrigerator and that got me thinking of lemon and strawberry scones. I couldn’t resist the temptation, lemon and strawberries just sound like they were made for each other such as lemon and blueberries. And as the summer draws to an end it will be hard to find nice fresh strawberries so this is a nice last fling for the summer. I found a lemon scone recipe in my Joy Of Cooking cookbook, which looked very tempting. It did not include strawberries, but I tweaked the recipe a little to include them. 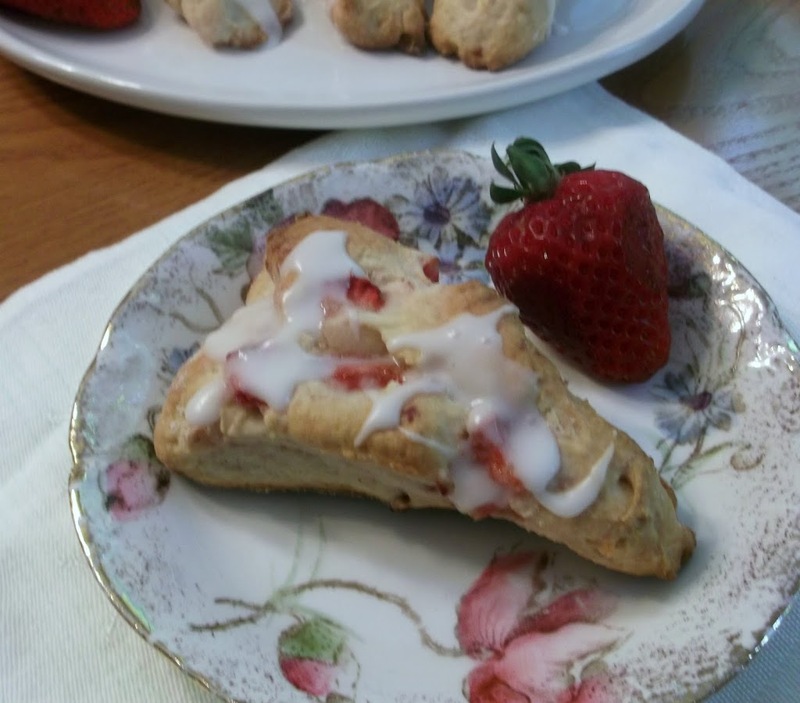 The lemon strawberry scones were a hit with the family. 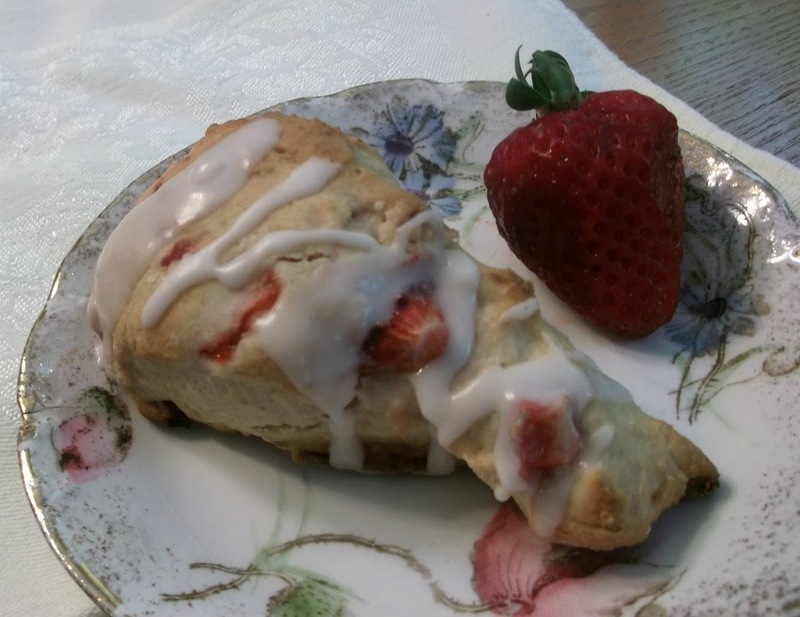 The strawberries kept the scones a little on the moist side, which I liked. I topped off the scones with a lemon glaze just to give a little more pizzazz. One of the things I like about scones is that they freeze very nicely. It’s a nice treat to take them out of the freezer and pop them in the microwave for a bit, to make a great breakfast or an afternoon snack. In a medium bowl mix flour, sugar, baking powder, and salt. Cut in butter, using a pastry blender or 2 knives, until the size of small peas. Beat the eggs in a small bowl. Add cream and lemon zest to the eggs and beat well. Make a well in the dry ingredients. Pour in the liquid and combine with a few swift strokes. Fold in the strawberries. Handle the dough as little as possible. Turn it out onto a lightly floured board. Pat to 3/4 inch thick. To make the classic wedge shape, pat into an 8 inch round and then cut into 8 to 12 wedges. Place on an ungreased baking sheet. Bake in a 375 degree oven for 15 to 17 minutes. Cool on wire rack. In a small mixing bowl add all ingredients and beat until smooth. lemon will add so much taste to it. I like the combination. They look fantastic – I wish I had one for breakfast! Lemon and anything gets my vote every time. These look terrific – I haven’t often combined lemon and strawberries, and I’m not sure why not. Excellent stuff – thanks. The Blueberry-lemon Scones were excellent – can’t wait to bake these!